A big thank you to everyone at the TAMUKAMI Hotel.We couldn't have asked for a better wedding ! Thank you very much !!! See you next year. Good stay.Especially nice and kind owner. Very nice & clean and big rooms with lovely environments! We shall come back again. Clean, well looked after. Our second time here and we will be back. Thank you! Terima kasih, thank you for welcoming us into your oasis. I will recommend you to my friends. Such a wonderful stay. Highly recommended. We had a wonderful stay – weather was fabulous, location great – thanks for your help with arrangements. Tennyson claire whitehouse say : " I Loved playing with Putri and the rooms ".Lovely lovely lovely !!!! Dear people of TAMUKAMI Hotel, we had a great week here, thanks to your kindness and hospitality. We wish you the best! Had a great stay at TAMUKAMI. The staff were very friendly. Love the authentic feel of the hotel – great small place to stay. Hopefully we will return. It has been a pleasure to stay here for 3 days. We all enjoyed the pool area. Great rooms! Thank you! An amazing place, pictures do not do justice!! Will be back for sure! Very beautiful, peaceful place. Thank you for having us! It was a wonderful stay! The staff was very friendly and the hotel area very quite. We loved to be here. The swimming pool was very nice. A truly wonderful place to stay! Friendly, quite and very welcoming. I would like to thank the staff for their very friendly attitude. Loved it!!! Have been staying at TAMUKAMI for many years and love it as much as ever! Its a little haven away from the hustle and bustle outside. Highly recommended, we look forward to retunring again in the future. Thanks for everything once again. Great stay, very good hospitality and enjoyable food, delicious! Thanks for taking good care. Very suprising like oasis with very pleasant staff.Rooms where very clean and well maintained. I Like TAMUKAMI !Terimakasih !! !See you ! So good ! We came back for the second time in our three week holiday ! Great staff,food +rooms, pool very quiet at night too + close to everything during the day. We had a lovely impression of Bali here. A wonderful place to begin our holiday. We have had a very relaxing time here, a quiet swim + read by the pool after diving each daya. The staff have been so helpful + friendly. The Gorgeous owners so welcoming. I will remember the flowers in ourears for many years to come.Thank you. Absolutely Loved Staying Here.Fantastic food, rooms, pool area. Beatifully clean and sparkly will be back on January. Thanks so much for my lovely birthday celebration. So welcoming-All is great !! Thank you. Our stay in your beautiful hotel it was very pleasent. We hope we will came back again. Your hotel was like home for from home. The staff very nice, helpful.Thanks a lot.Suksma. Thank you for the beautiful time ! This is a friendly, nice and lovely place.We also enjoyed the excellent food here ! We have returned for the second time and we enjoyed the finally service , great location and the music at night ! We enjoyed our stay. TAMUKAMI is very peaceful great location will det be back next year. Thank you for 3 good nights.The atmosphere is nice and quiet and cozy.Food is good. We had a very good experience here on TAMUKAMI. Thank you for your hospitality. We enjoyed our time here. Great place ! We had a really good time ! Thank you we had a lovely stay. Lastnight suckling pig and music.Was great ! We had a great time in your hotel !It has a very homely feel to it. Thank you for everything. Will be back. Beautiful hotel. Travelled 1 month in Indonesia. This was one of the best places 1 stayed. Beautiful room + friendly staff. Great stay, Great food, Great people.We will stay again. Very nice hotel full of atmosphere and friendly people / staff. Next time we will stay longer. This is our 4th time here and you are still going strong !Thanks for everything !. Thank you so much TAMUKAMI hotel.We family enjoyed so muchVery relaxing and nice and cozy hotel. Quiet surroundings, lovely staffs.Good foods, excellent hospitality. 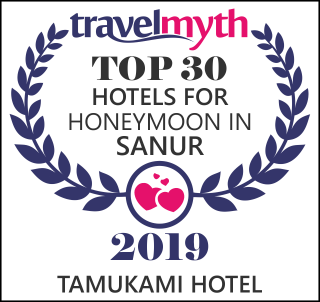 We'd love to come back to this TAMUKAMI hotel !!! A great stay in possibly the biggest bed l've ever stay in ! lovely breakfest and great staff we'd be happy to come back . Lovely quit stay, beautiful gardens too ! !Thank you very much will recommend to anyone coming to sanur. Beautiful surroundings – we loved all the frandy trees arund the pool and our balcony . Very friendly and helpful staff and lovely big comfortable bed . Thank you . Very nice hotel very quite and relaxing stay . Lovely hotel and staff,wish we could have stayed longer. Thankyou tu all the wonderfull people at tamu kami hotel. We very much loved our time here and wouldn't hesitate to recomended the hotel to our friends in the future. Wish you all good luck & future in the future. 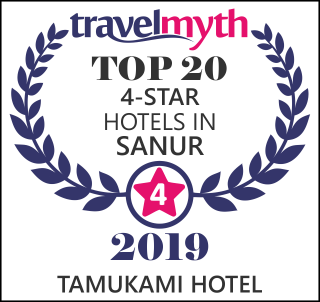 First time for us to stay in sanur , realy happy we followed the trip advisor web site and picked TAMUKAMI hotel , the staff all wonderful . thank for providing such a beautiful relaxing enviroment for us to enjoy our holiday . Was another wonderful visit at tamu kami such wonderful staff . thank you again . We were so happy with TAMUKAMI ! your staff are truly lovely and we were more than happy with our private room and balcony . The grounds are beautiful and we would recomended this resort to our friends and family , thank you with blessings . Thank you so much for a lovely , family friendly stay ! Beautiful garden , nice hospitality clean and pleasent swiming pool . Thank you everything for Bali . Name : Mr. Triten Andrew (10 Sept 2013). Thank you very relaxing stay it so much we stayed longer ! Thank you for a lovely stay.We hope to come here again the next time . Beautiful pleace to stay loved the room , pool area & food wonderful will recommend ! We had a great time here ! !Thank for all your smile Really nice staff , beautiful pool & garden. We will come back . What a wonderful place ! we hat a great time , swimming pool and a friendly staff. A beautiful place to spend our honeymoon . we will be back for sure ! My first time in Bali and I could not have asked for a better stay ! I will be back. I wish I could take me pool + weather home with me . Good hotel , good addres for us and our friends .Thank you .